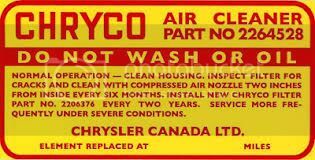 Think I'll print it and take it to my local mopar dealer to see if they have any. 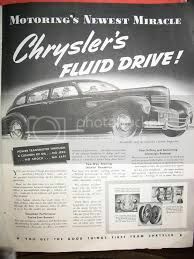 I doubt if you' find anyone old enough working at the dealership,much less find the parts!Did you notice Buy War Bonds? It was a different world then. Nothing was precision. We overhauled car, truck, and farm equipment engines every year, and I don't recall ever having an engine rebored for service, though some hotrodders rebored the limit for performance reasons. We didn't even hone the cylinder walls, but instead scuffed them with emery cloth. When chrome rings became popular, the rings often wouldn't seat for a couple thousand miles. The same with rods and mains. We never turned the cranks. If there were scratches on the journals, clean them up with emery cloth and install undersize bearings. Standard procedure was to install .001 undersize bearings when you overhauled an engine, and sometimes the engine would be so tight the starter wouldn't turn it over and the car had to be push-started. Seems like a Neanderthal way of doing things, but even the dealerships worked this way. I'm not quite as old as you, Gary.........but that's the way it was done.....even at the dealerships! People today don't even have a clue that it was "normal" for an engine to use a quart of oil in 400-500 miles.....heck; they don't even CHECK the oil anymore!! Remember , back in the '50's-'60's, where you could always tell an old Ford or Chevy by the amount of blue smoke coming out of the exhaust??? And you actually tested the engine for tightness and performance by coasting down a steep hill in a lower gear, under high manifold vacuum, and then quickly accelerating........just to see how much blue oil smoke would come out after getting past the rings/pistons! Pretty primitive stuff.....BUT it worked! Lol!